One recipe may say to use a crock pot and another recipe may say to use the slow cooker. Are they interchangeable? Is one better for a certain type of meal than another? A Crock-Pot is a slow cooker. But a slow cooker is not necessarily a Crock-Pot. Oh no! A crock pot is a type of slow cooker with a stoneware pot that sits inside a surrounding heating element. 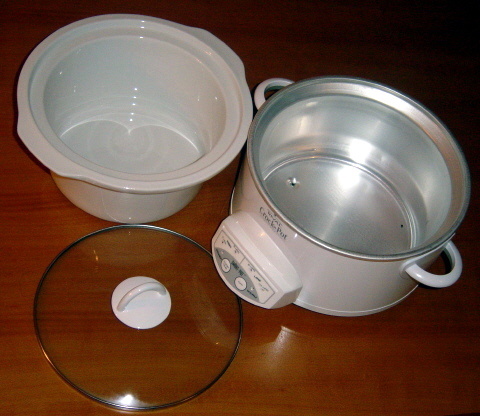 A slow cooker is a pot, usually made of metal, which sits atop a heating surface. However, when you are shopping for such a cooking device, manufactures use the names interchangeably. How The Slow Cooker Gets The Job Done. The base of the slow cooker has a doubled-walled metal compartment that contains the heating elements. As the elements heat up, they warm the insulated air trapped between the two metal walls. Heat is then transferred to the air between the inner metal wall and the stoneware pot. The hot air heats and cooks the food slowly and evenly. As the heating elements do not make any direct contact with the stoneware pot; there are no hot spots and, therefore, no need for stirring. 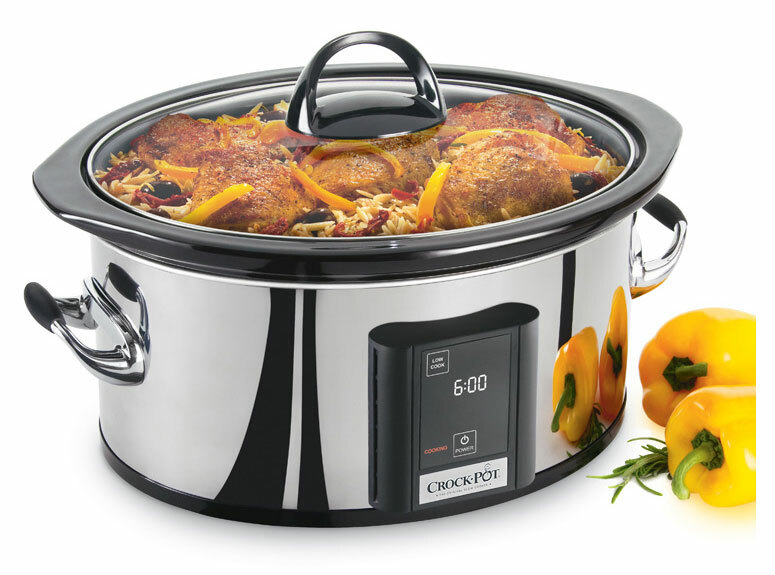 Crock pots and slow cookers both have three parts–a pot, a lid, and a heating element. However, a crockpot has only two cook settings, “Low” and “High.” There may also be a “Keep Warm” setting to allow the pot to warm before serving. The temperature at these settings remains constant. A slow cooker has a number of different settings, usually numbered one to five. The heating element on a slow cooker usually cycles on and off. Some slow cookers have a timer that can be set to cook for a number of hours. Crock pots and slow cookers come in various sizes to suit family size and specific purposes. However, crockpots are generally heavier than metal slow cookers, and may be more difficult to manipulate when washing. Since crock pots are made of stoneware, they also break more easily when dropped. 1. There is only one dish to clean. 2. It is a great way to use extra vegetables and inexpensive meats. Less expensive or tough meats, such as chuck roasts or steaks and stew beef, are tenderized through the long cooking process. Put it in the crock pot, add some seasoning, and you end up with a tender, tasty meal. 3. Cooking in a crock pot makes your house smell really good. 4. Slow cooked food is more flavorful and tender. The extended cooking times allow better distribution of flavors in many recipes. The lower temperatures lessen the chance of scorching of foods which tend to stick to the bottom of a pan and burn easily in an oven. 5. It’s convenient to cook in a crockpot. You can put all the ingredients in and then do your thing: go to work, school, yoga, whatever. And when you come back, the meal is ready. Whenever you purchase a new slow cooker, use it the first few times, on HIGH and on LOW, before leaving it unattended to make sure the vessel operates correctly. Remember to place the cooker on a cookie sheet, granite counter top, the stove top, or a similar surface. The bottom can get quite hot. Slow cooker recipes often say to brown meat before adding to the slow cooker, but this isn’t necessary, though it gives meat a nice color. If you add paprika to chicken before putting it in the slow cooker, a brown color is created while cooking. Flouring meat before adding it to a slow cooker helps to keep it moist and thicken the sauce. Don’t lift the lid while cooking, or the food will take longer to cook. – Large cuts of meat such as boneless prime rib or leg of lamb are still best when oven roasted. – Except for stews and chowders, the slow cooker does not cook fish very well. – The slow cooker collects a lot of the juices since the steam does not escape during cooking and these juices can become diluted and watery, which can affect the flavoring of the food. – If not careful, a slow cooker can overcook food, especially some of the more tender meats and poultry. Most slow cooker recipes are intended to serve four to six people, so cooking for two usually requires recipe adjustments. Generally, you can just cut a recipe in half, but be careful about quantities of spices and texture ingredients like baking powder and eggs. If the recipe already calls for a small amount of spices or herbs (like 1 tsp. oregano) you can probably leave the original amount, even for a smaller recipe. If you reduce spices too much, you’ll end up with bland food. Remember that smaller portions also cook faster. It helps to be around the house the first time you try a new recipe so you can check its progress, but this isn’t always possible. For two-person meals, plan to reduce the heat or cooking time, or sometimes both. Cook your food for about three-quarters of the time the larger recipe suggests, and turn down the heat one or two notches to avoid scorching. If you’re going to be at work all day, put the crock pot on a low setting. You can always turn the heat up to finish the meal when you get home, but if your food is burnt or overcooked, there’s not much you can do. Another option for two-person cooking is to make the larger serving recipe and freeze the leftovers. Extra food can be frozen in individual or two-person portions and thawed at your convenience, saving you even more time. The recipes below are designed to take advantage of what a slow cooker does best – long, low-heat cooking with lots of moisture. They do not require multistep preparations and can be assembled the night before, refrigerated in the cooking dish and placed on the cooking vessel just before you leave for work. Place onion in a 5- to 6-quart slow cooker. Place half of the pork chops on top of the onions. Sprinkle with half of the Italian seasoning, garlic, salt, and pepper. Repeat layering with remaining pork chops, Italian seasoning, garlic, salt, and pepper. Top with tomatoes and balsamic vinegar. Add zucchini or pepper pieces to cooker. Using a slotted spoon and tongs, transfer meat and vegetables to a serving platter; cover and keep warm. In a medium saucepan stir together cornstarch and the cold water; stir in cooking juices from cooker. Cook and stir over medium heat until thickened and bubbly; cook and stir for 2 minutes more. Serve over meat and vegetables. Serve with orzo. Mix all ingredients except pasta in a 3 1/2- to 4-quart slow cooker. About 30 minutes before serving, stir in pasta. Increase heat setting to High. Cover and cook 20 to 30 minutes or until pasta is tender. Layer lentils, onions, bell pepper and garlic in the bottom of a 4- to 6-quart slow cooker. Pour in the tomatoes and sprinkle with oregano, crushed red pepper flakes and salt. Pour in broth and vinegar, cover and cook on low until lentils are very tender, about 7 hours. When polenta is thick and smooth, pour it into an 8 inch greased square pan. Spread the polenta evenly. Bake in a 350 degree F. oven for 15 to 20 minutes. Remove from oven and allow to cool in the pan. Cut into serving pieces. In a 5- or 6-quart slow cooker place potatoes, carrots, celery, and onion. Place chicken pieces on top of vegetables. Sprinkle with parsley, salt, rosemary, thyme, pepper, and garlic; add broth and wine. Cover and cook on low-heat setting for 8 to 9 hours or on high-heat setting for 4 to 4 1/2 hours. Using a slotted spoon, transfer chicken and vegetables to a serving platter; cover with foil to keep warm. Strain juices into a large saucepan and whisk in flour and add butter. Turn on heat and cook and stir until thickened and bubbly. If desired, sprinkle chicken and vegetables with snipped thyme. Pass gravy with the chicken and vegetables. Makes 6 servings – (3 1/2 ounces cooked meat, 1/3 cup gravy, and 3/4 cup vegetables). Ratatouille is versatile and can be used on pizza, pasta or as part of a casserole or a lasagna. Next sprinkle half the basil, oregano, parsley, salt and pepper on the veggies. Trim fat from roast. Cut roast into 2-inch pieces; set aside. In a 4- to 5-quart slow cooker combine potatoes, carrots, onion, and fennel. Add meat to cooker; sprinkle with rosemary. In a medium bowl whisk together broth, wine, tomato paste, tapioca, pepper, and garlic. Pour over all meat and vegetables in cooker. Cover and cook on low-heat setting for 8 to 10 hours or on high-heat setting for 4 to 5 hours. Stir in basil just before serving. What Can I Do With Winter Squash? Where would Italian cuisine be without America? Strange as it might sound, just imagine how astonishingly different Italian food would be without tomatoes to make pasta sauces or corn for creamy polenta. Think of the gastronomic delights we would be missing! Take zucchini, a type of squash. They’ve become so intertwined with Italian cooking and culture, that Americans even call them by their Italian name –– although they originated on this side of the globe. In fact, just like tomatoes and corn, squash of all shapes and sizes were yet another culinary gift from the new world. Part of the large cucurbitaceae family –– which includes everything from pumpkins and winter squash to zucchini, melons, and cucumbers –– are said to have originated in the South American Andes and were grown in several parts of the American continent well before Columbus ever set foot on it. So, it doesn’t come as much of a surprise that here in the U.S. the fall season is associated with pumpkins and winter squash. Yet, most of us have a rather superficial acquaintance with them, often limited to the Halloween Jack-o-Lantern, a few pretty ornamentals, lots of pumpkin pie, and the occasional squash soup. But try walking through a farmers market these days, and you’ll be hit by an astounding assortment of squash of all colors and forms, from traditional orange pumpkins to smaller delicata and butternut squash to big hubbards. What other food can be mashed to make comforting soups and delicate purées, stuffed into ravioli, used in a flavorful risotto or hollowed out to look like a scary skull lit from within by a candle? Although called “winter” squash, these fruits really start appearing in late summer and keep growing through December –– some kinds grow even further into the winter. Unlike summer squash, such as zucchini or yellow squash, which are harvested and eaten in the immature stages when the rind is still soft, winter squash are harvested when the fruit is fully mature and the rind is hard. Yes, I said fruit. All squash are botanically fruits. But can be used as a fruit or a vegetable. If you’re a squash newcomer whose experience is confined to pumpkin pie topped with whipped cream, start out with a butternut or a delicata squash and you won’t be disappointed. Butternut squash are light beige with a peanut-like shape, and they taste somewhat like sweet potatoes. Delicata squash are smaller and narrower, their rind is usually yellow with a few green streaks and the flavor is delicate. Other culinary favorites include acorn squash, a round globe, with even groves around the entire squash. They are mostly dark green, with occasional splotches of orange and yellow, that make a hearty soup; hubbard, a large, bumpy and thick-skinned squash with a fairly sweet flavor; kabocha, a drier, flakier type with a round shape and a flattened top, green in color with occasional white stripes; and spaghetti squash, which has nothing to do with the pasta, but is so called because its flesh is stringy and turns into strands that resemble spaghetti when cooked. Native Americans once believed squash was so nutritious that they buried it along with the dead to provide them nourishment on their final journey. Squash were originally grown for the seeds because they were believed to increase fertility; however, with the evolution of squash, plants produced fruit that had a thicker skin, fewer seeds and less waste. The hard-shelled squash species are uniquely American. The earliest natives revered them, and gave them the honor of being one of the “Three Sisters”. Beans and corn completed the trio, and without those foods for sustenance, many ancient peoples would have ceased to exist. The Three Sisters were vital to many civilizations. The corn and the beans made a complete protein, the squash supplied beta carotene, Omega 3 and Potassium. Whole communities could survive on these alone, if game and other foods were scarce. They were also one of the first companion plantings, each contributing to the growth and well-being of the others. The corn supplied support for the beans to climb on, and shade for the squash plants during the heat of the day. The squash plants large leaves shaded the ground, prevented weeds, and deterred hungry wildlife that didn’t like to walk through the fuzzy vines. The beans fixed nitrogen in the soil to feed the corn and the squash. The European conquerors carried the squash back across the Atlantic, and many varieties were created around the Mediterranean Basin. Winter squash never caught on in the more northern parts of Europe though, as the climate was too cool, and the season did not last long enough to properly grow them. France, Spain and Italy are European countries which have embraced the squash, and raised its cultivation to an art form with many unique varieties springing from that area. Wonderful varieties have been developed in Australia also, as the climate there is quite hospitable to raising winter squash. Although types of gourds were found in tombs of Egypt, the butternut squash and its family members including the pumpkin and the calabaza are new world, native Americans. The butternut is the new kid on the block having made its appearance in 1944. Most people ask what the difference is between a winter squash and a pumpkin. A pumpkin is just another hard-shelled winter squash. What makes winter squash different from a summer squash? It’s simply the time of year in which they are eaten. The early American settlers gave them those designations. Summer squash are soft-skinned vegetables which grew quickly, and were eaten soon after harvest. Winter squash grew the thick, hard rinds that made them suitable for storing through the long winters when fresh vegetables were a precious commodity. Winter squash comes in many shapes, sizes, textures and flavors. Chances are, there will be one variety out there that will suit your family. Here are a few popular ones. The ‘Waltham Butternut’ is a smooth-skinned squash with a meaty texture. It is prolific and easy to grow. It keeps well in a cool, dark storage area, and it’s small enough that 1 squash will feed an average family. The ‘Blue Hubbard‘ is a huge, heavy squash that requires more than just a paring knife to open it. The thick rind needs a small hatchet or saw to cut it open, but it will keep well into spring with nothing much more than a dry, cool spot. Not for the ‘Squash Novice’ as it occasionally will reach over 30 pounds, and 1 squash feeds a small army. The flesh is smooth and not stringy, somewhat on the dry side, but quite pleasing. ‘Carnival’ is a variety of acorn squash found in many supermarkets, and is a great selection for a two person meal. Use the squash as the main meal instead of meat, stuffing the halves with a seasoned rice mixture. Each person being served their own personal, edible bowl. For a simple side dish, simply drizzle with butter and brown sugar before baking. BUYING The rind should be firm and unbroken with a uniform matte coloring. Squash should feel heavy for their size (indicating a high moisture content – squash gradually lose water after harvesting). Bigger squash generally have a more highly developed flavor. STORING Squash are amongst the longest keeping vegetables. In a cool (not refrigerator-cold), dry, well-ventilated place they can keep for three months or more. At room temperature, or in the refrigerator, they will deteriorate more quickly, but should be fine for at least a couple of weeks. PREPARATION The hard rind, dense flesh and awkward shape mean that squash require careful cutting. Use a large knife or cleaver to make a shallow cut down the length of the squash (curves permitting). Place the blade in the cut and knock the back of the blade (using your hand, a wooden mallet or rolling pin) until the squash is cut in half lengthways. Scoop out the seeds and any fibrous-strings . If you require chunks of squash, cut a small piece off each end, enabling you to stand it vertically and trim off the rind before slicing and dicing. Squash should be cooked until tender. Baking a halved squash is an excellent way of preserving and intensifying its flavors. Cubes can also be added to casseroles. Boiling is quicker than baking but will result in some sugars being absorbed into the water and so is best used for dishes (such as soups) where the flavored water forms part of the dish rather than being discarded. Save the Seeds! The seeds of winter squash are delicious when toasted. Rinse them well and pat dry. Toss them lightly in oil and a little salt, spread them on a sheet pan, and bake at 250 degrees for about 1 hour. If you’d like to brown the seeds slightly, turn on the broiler for the last 4-5 minutes of baking. Let cool and store in a sealable bag or jar with a lid. Not only do they taste great, they’re nutritious and good for you! Bring the water to a boil in a medium nonstick saucepan on medium heat. Stir in the salt. Slowly stir in the cornmeal with a whisk. Reduce heat to medium low, cover and set timer for 5 minutes. When timer goes off, check to see if it’s cooking at a slow simmer, adjust heat accordingly and whisk gently for a minute. Repeat every 5 minutes, adjusting temperature and whisking. When it thickens, uncover and stir for 2 – 3 minutes. Stir in the butter and three quarters of the Parmesan and stir until melted. Stir in the cooked squash and combine well. Taste and adjust seasonings. BAKING Transfer to a greased baking dish. [If you’re cooking ahead, stop here and refrigerate. Return to room temperature.] Top with reserved Parmesan. Bake at 350 degrees F. for 60 minutes. Top with oven roasted vegetables or Italian tomato meat sauce. Directions: Combine the chicken broth and wine in a small saucepan and set over medium heat. In a medium (3-qt.) saucepan, heat the oil over medium heat. Add the sage leaves and cook, turning once, until they’ve turned dark green in most places, about 1 minute total. Don’t brown. With a fork, transfer to a plate lined with paper towels to drain. Put the pancetta in the saucepan and cook, stirring occasionally, until nicely browned, 5 to 7 minutes and transfer to the plate with the sage. Add the shallots to the saucepan and cook, stirring with a wooden spoon, until softened, about 1 minute. Add the squash and rice and cook, stirring, for 1 minute. Ladle in enough of the hot broth mixture to just cover the rice. Cook, stirring frequently, until the broth is mostly absorbed. Add another ladle of broth and continue cooking, stirring, and adding more ladles of broth as the previous additions are absorbed, until the rice is tender with just a slight bite, about 25 minutes. As the risotto cooks, adjust the heat so that it bubbles gently. The broth mixture needn’t be boiling; it should just be hot. If you use all the broth and wine before the rice gets tender, use more broth but not more wine. Set aside 4-6 sage leaves as a garnish (1 leaf per serving). Crumble the pancetta and the remaining sage leaves into the risotto. Stir in the Parmigiano. Season to taste with salt and pepper. Garnish each serving with a sage leaf. Serves six as a primo (first) course, or four as a second course. Directions: Preheat the oven to 400°F. Coat a 13″ x 9″ baking dish and a baking sheet with nonstick spray. Place the squash, cut side down, on the sheet. Bake for 30 minutes, or until tender when pierced with a sharp knife. With a fork, scrape the squash strands into a large bowl. Meanwhile, warm the oil in a medium skillet set over medium heat. Add the onion, garlic, and basil. Cook for 4 to 5 minutes, or until the onion is soft. Cook for 3 to 4 minutes, or until the mixture is dry. To the bowl with the squash, add the ricotta cheese, mozzarella, parsley, salt, and the onion mixture. Stir to mix. Pour into the prepared baking dish. Sprinkle with the Parmesan and bread crumbs. Bake for 30 minutes, or until bubbly, heated through and the top is brown. Directions: Preheat the oven to 400°F. Halve the squash lengthwise and remove the seeds. Place the squash, cut side up, in a baking pan. Season with 1/2 teaspoon each of the salt and pepper and cover tightly with foil. Bake for about 1 hour, until the squash are tender but not mushy. Let cool slightly. Meanwhile, in a medium saucepan, combine the leek, olive oil and 2 teaspoons of water. Cover and cook over moderately low heat until the leek is soft and translucent, about 5 minutes. Uncover and stir in the wine. Increase the heat to high and boil until the liquid is reduced to approximately 3 tablespoons, about 3 minutes. Stir in the broth, milk, honey and remaining 1/4 teaspoon each salt and pepper. Remove from the heat. Using a big spoon, scoop the flesh from the squash in large pieces. Place in a medium bowl. To assemble the gratin, preheat the oven to 400°F. Bring the leek mixture to a boil. Spoon half of the squash into a 6- to 8-cup casserole. Ladle half of the leek mixture over the top and cover with half of the toast and half of the Fontina. Repeat the layers with the remaining squash, leek mixture, toast and Fontina. Sprinkle the Parmesan cheese over the top. Bake the gratin for 30 minutes, or until the top is browned and bubbly. Garnish with the basil and serve. MAKE AHEAD: The recipe can be prepared through Step Three up to 3 hours ahead. Return to room temperature before baking. Directions: Preheat the oven to 350 degrees F. Then lightly season the cut sides of squash with 1 tablespoon olive oil, salt and pepper. Place the halved squash in a baking dish, flesh side down, and add 1/2 cup water to the pan. Cover the pan tightly with aluminum foil and bake until tender, about 1 hour. Remove from the oven and cool completely. In a large skillet brown the sausage over medium-high heat, about 6 to 8 minutes. Remove the sausage from the pan and drain on paper towels. Wipe out the pan with paper towels. Heat the remaining olive oil in the pan, and add the onion and bell pepper, sauté until soft, about three minutes. Add the garlic, tomato and cook an additional minute. Remove the pan from the heat. In a large mixing bowl, mix the sausage with the vegetables, bread cubes, chicken stock, the mozzarella cheese, parsley and dried sage. Add the egg and stir well to combine. Season to taste with salt and pepper, and mix well. Divide the stuffing mixture between the baked squash halves, and top with the Parmesan cheese. Place the filled squash on a baking sheet and place in the preheated oven. Bake until the squash are heated through and the cheese melts, about 25 minutes. Turin (Torino in Italian) is an interesting and often overlooked city in the Piedmont (Piemonte in Italian) region of Italy. It is in the northwest section of the region between the Po River and the foothills of the Alps. The city is famous for the Shroud of Turin, Fiat auto plants, Baroque cafes and architecture and its arcaded shopping promenades and museums. 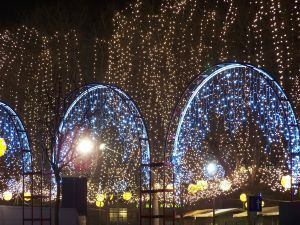 Turin hosted the 2006 Winter Olympics because the nearby mountains and valleys are a huge attraction for winter sports. This hilly region bordering France and Switzerland is, also, ideal for dry farming grapes which are deep-rooted enough to withstand periods of dry weather. The Piedmont region has some of the best food in Italy. Over 160 types of cheese and famous wines, like Barolo and Barbaresco, come from here, as do truffles, the very expensive mushroom. Turin has some outstanding pastries, especially chocolate ones. Chocolate for eating, as we know it today, (bars and pieces) originated in Turin. The chocolate-hazelnut sauce, gianduja, is a specialty of Turin. Turin derives its name from the Celtic word tau, meaning mountain, and was founded almost 2400 years ago by a Celtic tribe, the Taurini. The Taurini conquered much of France and part of Spain before heading into what is known today as Italy. In Italian torino means “little bull”. The bull is still part of the city standard (flag) to this day. After the fall of the Roman Empire, Turin, which was always prized for its fertile land and access to the Po River, was conquered by various barbarian tribes including the Goths, Lombards and Franks, who established the city as an earldom in the 8th century A.D. However, when the Savoy family dynasty conquered the city in the year 1280, the city would finally begin its rise to prominence. The history of Turin for the next 600 years is tied to that of the House of Savoy. The Savoys are also credited with bringing art, culture and architecture to Turin. The Savoys certainly spared no expense to make Turin beautiful. However, despite their best efforts to ‘Italianize’ the city, Turin’s layout is often compared to Paris more than any other Italian city. The Savoys would reign over Italy until Benito Mussolini’s Fascists took over the country at the beginning of the 20th. century. By this time, Turin had turned its attention to industry and is, still, one of the world’s greatest automobile centers. Turin has been producing chocolate for over three centuries. The origins of the city’s chocolate-making art can be traced back to the year 1678, when Madame Reale, who was then the Queen of the Savoy state, granted the first ever “license” to Turinese chocolate maker Giò Antonio Ari to make chocolate. Thus began the city’s closest relationship with chocolate, which continues until this day. The chocolate varieties created by Turinese chocolatiers are truly special and include several specialties, like the traditional Gianduiotto, which is shaped like an upturned boat and crafted out of sugar, cocoa and hazelnut paste; the Baci di Cherasco (Cherasco Kisses) which are made with dark chocolate and hazelnuts; the Alpino which contains a liqueur cream and is named after the hat worn by the Italian military regiments; and the Bicerin, which is a truly decadent layered hot chocolate coffee drink. The chocolate most associated with Turin is gianduia. However, long before they started putting hazelnuts in chocolate, Turin was a major player in the world of European chocolate. Turin chocolatiers began selling chocolate in 1678, almost 200 years before the first Gianduia candy bar entered the chocolate scene in Turin. Gianduia, a blend of milk chocolate and ground hazelnuts, was invented due to the high cacao prices and problems with supply. In order to extend their supply of cacao, chocolatiers added hazelnuts that were, and still are, in abundance from the local Langhe area. One of the most popular combinations of chocolate and hazelnuts, worldwide, is Nutella. Ferrero-Rocher, located in the nearby city of Alba, began producing the popular spread in 1945. First is was called Giandujot, then Supercrema, then Cremalba. In 1964 it became Nutella. Almost every chocolatier and sweet shop in Turin has a local version of the spread, using just as many variations as its numerous names. These artisanal versions are more likely to actually use Piedmont hazelnuts and less likely to have palm oil or preservatives that come with the mass produced spread in the rest of the world. Nocciolati – Nocciolati are gianduia chocolate bars with whole roasted hazelnuts throughout. These, along with other chocolate variations, decorate many chocolate storefront windows in Turin. They are sold by weight, usually the etto (100 grams). Nocciolato fondente is a dark chocolate bar with hazelnuts; nocciolato latte is milk chocolate with hazelnuts, and nocciolato bianco is white chocolate. Little bite-size versions are nocciolatini. Cremino – In 1911 to launch its Fiat 4, the Turin-based auto manufacturer held a contest for Italian chocolatiers to create a chocolate in honor of the new car. “Il Cremino” made by Aldo Majani in Bologna won. For many years it was known as the Cremino Fiat. A square shape, it is layers of chocolate, initially four layers, but now made with three-layer. Two of the layers are gianduia chocolate. The middle layer varies in flavor and can be hazelnut cream, dark chocolate or coffee cream, to name just a few. Tris di Nocciole – A classic in chocolate shops in Turin, they are simply three roasted hazelnuts covered in chocolate. You can find them in all three chocolate variations; dark, milk and white. Tartufi (truffles) – Although they are a specialty of Turin, you can find truffles all over the world. Named after the expensive fungus they resemble, these balls of ganache, sometimes with a little liquor added to the ganache, are traditionally rolled in cocoa powder. Rochers – Ferrero-Rocher (the company that also makes Nutella) introduced these “rocks” to the world in 1982. Many chocolatiers in the city make them. If you love chocolate and hazelnuts, this is a dream combination. Generally, they start with a chocolate-covered hazelnut at the center; gianduia cream encases it. A very thin wafer is wrapped around the gianduia cream, separating it from the final coating of milk chocolate and chopped hazelnuts. 4 Remove from heat and whisk in coffee and creamer (if using, it thickens the drink a bit). To serve: empty glass and dry. Layer ingredients in the glass by placing shot of espresso in the bottom and then, while slightly tilting the glass, slowly pouring in hot chocolate. Remove shaker from freezer, add cream, and shake vigorously until frothy, at least 20 times. Spoon shaken cream on top of hot chocolate and serve immediately. Tip: For an alcoholic bicerin, add 1 part coffee-flavored liqueur to the hot chocolate before layering it. 1. Mix the cocoa powder and sugar together in a small saucepan. Stir the 1 1/2 cups milk into the saucepan until the sugar has dissolved. Place over low heat; slowly bring the mixture to a low simmer. 2. Whisk the 2 tablespoons of milk together with the cornstarch in a small cup; slowly whisk the cornstarch slurry into the cocoa mixture. Continue cooking, whisking constantly, until the hot chocolate reaches a pudding-like thickness, 2 to 3 minutes. Top each serving with 1 tablespoon of whipped topping. Meanwhile in a small saucepan, heat water, milk, and honey over medium-high heat just until small bubbles appear around edge of pan. Whisk milk mixture into chocolate mixture until smooth. Serve fondue with cake and fruit. Combine the sugar, cocoa, cornstarch, salt, and eggs in a medium bowl, stirring well with a whisk. Heat milk over medium-high heat in a small, heavy saucepan until tiny bubbles form around edge (do not boil). Gradually add hot milk to sugar mixture, stirring constantly with a whisk. Place the milk mixture back in the saucepan and cook over medium heat until very thick and bubbly (about 5 minutes), stirring constantly. Spoon mixture into a medium bowl, and add liqueur, vanilla, and chocolate, stirring until chocolate melts. Place bowl in a large ice-filled bowl for 15 minutes or until mixture is cool, stirring occasionally. Remove bowl from ice. Gently fold in one-third of the whipped topping. Fold in remaining topping. Cover and chill at least 3 hours. Sprinkle with hazelnuts. 2. Lightly spoon flour into a dry measuring cup; level with a knife. Combine flour, flaxseed, soda, and salt in a bowl, stirring with a whisk. Set aside. Combine sugars, egg in an electric mixer bowl; beat at high speed for 2 minutes. Add vanilla; mix well. Add flour mixture to egg mixture; stir on low speed until combined. Fold in chocolate and almonds with a spatula. Turn dough out onto a floured board and divide dough into 3 equal portions. (I use a scale to weigh the dough.) Roll each portion into a 6-inch-long roll. Arrange the roll, 3 inches apart on a baking sheet lined with parchment paper. Shape each into a 6 by 1-inch log. Bake at 350° for 30 minutes or until firm. Reduce oven temperature to 325 degrees F.
3. Remove rolls from the baking sheet; cool 20 minutes on a wire rack. Cut rolls diagonally into 30 (1/2-inch) slices. Return slices, cut sides down, to the baking sheet. Reduce oven temperature to 325°; bake 10 minutes. Turn cookies over; bake 10 minutes (cookies will be slightly soft in center but will harden as they cool). Remove from baking sheet and cool on wire rack. 1. Preheat the oven to 350°F. Coat a 9″ springform pan with cooking spray and set aside. 2. Combine the cookie crumbs and margarine in a bowl and mix together. Press into the bottom of the prepared pan and refrigerate until ready to use. 3. Melt 2 cups of the chocolate chips in the top of a double boiler, taking care to keep the water from touching the bottom of the pan containing the chips. Remove from the heat and set aside. 4. Meanwhile, beat together the cream cheese, sour cream, eggs, and remaining 2/3 cup sugar or 1/3 cup sugar alternative with an electric mixer until smooth. Slowly beat in the flour, almond extract, and coffee granules. Add the melted chocolate and beat on high speed until well incorporated. 5. Pour batter into the prepared pan. Bake for 50 minutes. Remove from the oven and run a knife or thin metal spatula around the edge of the sides to loosen the sides but do not remove the cake from the pan. Place pan on a rack and let cool for 45 minutes. Remove the cake from the pan and chill in the refrigerator for 3 hours or overnight. 6. When the cake is chilled, melt the remaining 1 cup chocolate chips in the top of a double boiler and stir in the half-and-half. Cool slightly and pour onto the top of the cake. Spread with a spatula to the edge so that some of the chocolate runs down the side of the cake. Chill until ready to serve. Toss the raspberries with 1 tablespoon of the sugar. Serve with cake. How Many Ways Can You Make Lasagna? While the history of the origin of a particular food can be very contradictory, there are usually some true facts in the different versions of how a food originated in a particular country. Lasagna has one of those conflicted origins, however the description, if not the origin, included here, is one commonly found in the culinary history books. The history of the name of these noodles is actually quite interesting. “Lasagna” is derived from the Greek lasanon, which means “chamber pot.” The Romans borrowed the word to refer to cooking pots of a similar shape, and eventually the word came to be used to refer to the noodles which were traditionally layered in a lasanum, a Roman lasagna dish. With the expansion of the Roman empire, this new “lasagnum” dish spread all across Europe, eventually reaching Britain, where it was published in a cookbook, The Forme of Cury, in the late 14th. century, which led to Britain claiming the origin of the dish was within their country. 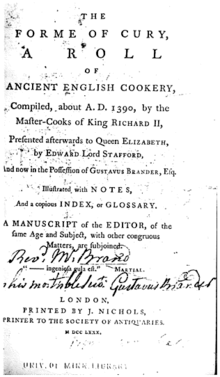 Documented historical accounts, tell us that the first printed recipe with tomatoes appeared in 1692. If lasagna includes tomatoes, then it would have not been known, in its present form, until somewhere around 1700. Most likely present day lasagna may have no ancient roots, but may very well be a dish that was re-invented at a much later date. The early Italians changed the name from “lasagnum,” to “lasagna or in Italian, lasagne,” which is the current form. Over the years, the word “lasagna” began to change definitions; the word previously referred to the serving dish it was baked in, but later began to simply mean a pasta meal in the dish itself. In modern cooking terms, it now means layers of thin pasta, with meat, cheese and tomato sauce layered in between. It seems that lasagna takes a different form not only in the various provinces of Italy but also from the diversity of every home. Some lasagna recipes are meat based, others are made from vegetables, such as spinach or artichokes. Some folks add hard boiled eggs and peas; others do not. In the end, what goes between the layers of noodles is as variable as the things you can find to put between them. With lasagna, it’s all about the freshness of the ingredients, especially the cheese. Some lasagna recipes have multiple cheeses, but most often you’ll find ricotta and mozzarella, especially in southern Italy. Some typical Italian lasagna specialties include Lasagna Alla Bolognese, which uses a tomato meat/white sauce and Lasagna Verdi, which includes spinach and cheese. Outside of Italy, there are many different types of lasagna, especially in the United States. From vegetable lasagna to spicy chipotle (Mexican) lasagna to everything in between. In Italy, lasagna noodles are totally flat, while American lasagna tends to be ruffled along the edges to help trap sauces. The best noodles are made from durum wheat, a particularly hard wheat which stands up to extended cooking, remaining chewy and resilient even after boiling and baking. 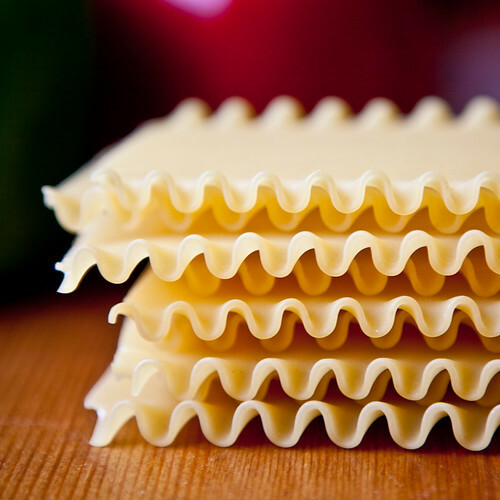 Some cooks prefer to use no-boil lasagna noodles, which are layered into a lasagna pan without being boiled in water. The moisture in the lasagna and the heat of the oven cook these noodles so that they become soft by the time the dish has finished baking. In using no boil noodles, I have found that the noodles taste better if soaked in hot water for 15 minutes before layering in the baking dish. Preheat oven to 375°F. Brush baking sheet with 1 tablespoon olive oil. Place eggplant pieces on paper towels. Sprinkle lightly with salt; let stand 20 minutes. Transfer eggplant to prepared sheet. Toss with remaining 1 tablespoon oil. Roast eggplant until tender, stirring occasionally, about 30 minutes. Set aside. Maintain oven temperature. Mix ricotta cheese, 1/2 cup Parmesan cheese, shallots and rosemary in large bowl. Season with salt and pepper. Spray a 13 x 9 x 2-inch glass baking dish with olive oil cooking spray. If using no boil noodles: Place noodles in large bowl. Fill bowl with hot tap water. Soak noodles until pliable, stirring occasionally to separate, about 15 minutes. Place large sheet of parchment paper on work surface. Transfer noodles to parchment in single layer, shaking off excess water. If using regular noodles, boil according to package directions. In a medium saucepan, combine chicken breasts, bay leaf, 1 teaspoon salt, and enough water to cover chicken. Bring to a boil; skim off any foam. Reduce heat to low; simmer 5 minutes. Remove pan from heat and let chicken cool in cooking liquid. Remove chicken and shred or chop into bite-size pieces. Set aside. In a large nonstick skillet over medium-low heat, heat 1 tablespoon oil. Add onion; cook, stirring occasionally, until softened, about 5 minutes. Stir in garlic and cook, stirring, 1 minute. Stir in mushrooms, 1/4 teaspoon salt, and 1/4 teaspoon pepper. Increase heat to medium and cook, stirring occasionally, until mushroom liquid evaporates, 10 to 15 minutes. Stir in sage and cook 1 minute. Return mushroom mixture to skillet and stir to combine; set aside. Place flour in a large saucepan. Gradually whisk in milk until smooth. Over medium heat, cook, stirring frequently, until sauce comes to a boil. Reduce heat to low and simmer 3 minutes, stirring constantly. Remove pan from heat; stir in 1/4 cup Parmesan cheese, nutmeg, 1/4 teaspoon salt, and 1/4 teaspoon pepper. Set aside. Preheat oven to 375° F. Spray a 13″ x 9″ baking dish with olive oil cooking spray. Place noodles in large bowl. Fill bowl with hot tap water. Soak noodles until pliable, stirring occasionally to separate, about 15 minutes. Place large sheet of parchment paper on work surface. Transfer noodles to parchment in single layer, shaking off excess water. In a small bowl, combine ricotta and mozzarella cheeses; stir well. Reserve 1 cup sauce for top layer. Spread 1/2 cup sauce in bottom of prepared dish. Arrange 4 lasagna noodles over sauce, overlapping noodles slightly to fit. Spread with 1/2 cup ricotta mixture. Spoon on half of mushroom mixture. Top with half of chicken. Pour half of remaining sauce over chicken. Repeat layering. Top with remaining lasagna noodles and spread with reserved 1 cup sauce. Coat a sheet of foil with cooking spray and cover baking dish. Bake lasagna 35 minutes. Uncover dish and sprinkle with remaining 1/4 cup Parmesan cheese. Bake uncovered 15 minutes. Let stand 15 minutes. In heavy large saucepan combine Wondra flour, milk, wine and butter. Cook over medium heat until sauce thickens and comes to boil, whisking constantly, 4 to 5 minutes. Remove from heat. Whisk in Parmesan cheese, nutmeg, garlic powder, salt and white pepper. DO AHEAD: Sauce can be made up to 1 day ahead. Cover and chill. Heat oil in large pot over medium-high heat. Add shallots and garlic. Sauté until shallots soften, about 2 minutes. Add spinach and cook about 2 minutes. Remove spinach from heat and stir in 1 1/2 cups sauce. Season spinach with salt and pepper. DO AHEAD: Spinach can be made up to 1 day ahead. Cover and chill. Mix ricotta, Parmesan, salt, pepper and lemon peel in medium bowl. DO AHEAD: Filling can be made up to 1 day ahead. Cover and chill. Preheat oven to 350°F. Spray 13 x 9 x 2- inch glass baking dish with cooking spray. Spread 1/2 cup sauce thinly over bottom of prepared dish. Top with 3 noodles, arranged side by side and covering most of bottom of dish. Spread half of spinach mixture over. Sprinkle with 1/3 cup Fontina. Top with 3 noodles and half of ricotta mixture Drop half of pesto over the ricotta by teaspoonfuls, spacing evenly apart. Continue layering with 3 noodles, remaining spinach mixture, 1/3 cup Fontina, 3 more noodles, remaining ricotta mixture, then remaining pesto. Top with last 3 noodles. Spread remaining sauce over; sprinkle with remaining Fontina. Cover dish with foil coated with cooking spray. Bake lasagna until heated through and bubbling at edges, 50 to 55 minutes. Remove from oven. Remove foil from dish. Preheat broiler. Broil the lasagna casserole until top is browned in spots, turning dish occasionally for even browning, about 4 minutes. Let stand 15 minutes before serving. Pulse carrot, mushrooms, and garlic in food processor until finely chopped; transfer to bowl. In Dutch oven heat 1 teaspoon of olive oil and brown ground beef. Remove to a paper towel lined bowl and wipe out pan with additional paper towels. Add remaining 1 teaspoon oil, onion, 1/2 teaspoon salt, and 1/4 teaspoon pepper to pan. Cover and cook over medium-low heat until onion is softened, 3 to 4 minutes. Add carrot, mushrooms, and garlic and cook, uncovered, until mushrooms release their liquid, 5 to 7 minutes. Increase heat to medium-high and cook until liquid has evaporated, 3 to 5 minutes. Add tomato paste and cook until paste begins to brown, about 2 minutes. Stir in browned beef and 1 cup milk, using a wooden spoon to break up any large chunks, and cook until most of the milk has evaporated, 5 to 7 minutes. Stir in tomatoes, 1 cup broth, crushed red pepper and bay leaf; bring to simmer and cook until sauce has thickened and most of liquid has evaporated, 45 to 60 minutes. Off heat, remove bay leaf, stir in basil, and season with salt and pepper. Meanwhile, whisk remaining 1 cup milk, remaining 1 cup broth, and Wondra flour together in medium saucepan until smooth. Bring mixture to simmer over medium-high heat and cook, stirring constantly, until thickened, about 2 minutes. Off heat, stir in 1 teaspoon butter, nutmeg and cheese. Season with salt and pepper. Adjust oven rack to upper-middle position and heat oven to 425 degrees F. and spray a 9 x 13 inch baking dish with olive oil cooking spray. Spread 2 cups meat sauce in prepared baking pan. Lay 3 noodles over sauce, leaving space between them. Repeat with 3 more layers, sauce and noodles. Spread white sauce evenly over top layer of noodles, leaving 1-inch border around edge. Bake until lasagna is bubbling around edges and top begins to brown, 25 to 30 minutes. Cool on a rack 20 minutes before serving. Make Ahead: You can make both the meat sauce and the white sauce up to 2 days in advance and refrigerate them until ready to use. Gently reheat the sauces separately before proceeding with the recipe. Heat oven to 350°F. Cook noodles as directed on package. Drain noodles. In medium bowl, mix Parmesan cheese, ricotta cheese and 1/4 cup parsley; set aside. Spray a 13×9-inch (3-quart) glass baking dish with cooking spray. Spread 3/4 cup of the sauce on the bottom of the dish. Top with 3 noodles. Spread half of the crabmeat and half of the shrimp and half of the scallops over the noodles. Spread with 3/4 cup of the sauce over the seafood. Sprinkle with 1 cup of the mozzarella cheese and top with 3 noodles. Spread ricotta mixture over noodles and spread the remaining seafood over the ricotta. Top with 3 noodles, spread 3/4 cup of the sauce over the noodles and sprinkle with remaining 1 cup mozzarella cheese. Bake uncovered 40 to 45 minutes or until cheese is light golden brown. Let stand 15 minutes before cutting. Sprinkle with 1 tablespoon parsley. This spicy sauce was developed in the town of Amatrice in central Italy and typically combines chilies, pancetta and tomatoes. Homemade lasagna noodles allow the sauce to shine through. Lightly spoon flours into dry measuring cups; level with a knife. Combine flours in a food processor; process 30 seconds. Combine 1/3 cup water, 2 tablespoons oil, and eggs in a bowl, stirring well with a whisk. With processor running, slowly pour water mixture through food chute, processing just until dough forms a ball. Turn dough out onto a lightly floured surface; knead lightly 5 times. Shape dough into a disk. Dust dough lightly with flour; wrap in plastic wrap. Let stand 30 minutes. Divide dough into 6 equal portions. Working with 1 portion at a time (cover remaining dough to prevent drying), press dough portion into a flat narrow rectangle. Roll the dough through the settings of a pasta machine into a rectangle the width of the roller, dusting with flour as necessary. Keep rolling the sheet through the machine on decreasing settings until you have rolled it through the next to last setting. Lay pasta sheet flat on a kitchen towel; cover. Repeat procedure with remaining dough portions. Cut pasta into lasagna length sheets that fit the lasagna dish you are using. Cook pancetta in a large nonstick skillet over medium heat until crisp. Add onion, 1 tablespoon oil, and garlic to drippings in pan; sauté 5 minutes or until browned, stirring frequently. Add 1/2 cup water and tomatoes; bring to a boil. Stir in 1/2 teaspoon each of salt and pepper. Reduce heat, and simmer 20 minutes or until slightly thick, stirring occasionally. Combine ricotta cheese, salt, ground pepper, chopped fresh parsley and ground nutmeg in a medium bowl. Bring 6 quarts water and 1 tablespoon salt to a boil. Slowly lower 1-2 pasta sheets into the boiling water; cook 1 1/2 minutes or until done. Carefully remove pasta from water with a slotted spoon; lay pasta flat on a damp kitchen towels and cover with another damp kitchen towel. Repeat procedure with remaining pasta sheets. Preheat oven to 350°F and coat a 9-by-13-inch baking dish with olive oil cooking spray. Spread about 1 1/2 cups tomato sauce in the prepared pan. Layer 3 noodles on top. Spread another 1 cup sauce over the noodles. Dot about 2/3 cup ricotta mixture over the sauce, then sprinkle with 1/4 cup mozzarella and 2 tablespoons Parmesan. Continue layering the noodles, sauce and cheeses, finishing with the sauce, mozzarella and Parmesan. Cover with foil sprayed with cooking spray. Bake the lasagna until the sauce is bubbling, 35 to 40 minutes. Uncover and bake until golden, 5 to 10 minutes more. Let cool for 10 minutes before cutting. A casserole, from the French word for “saucepan”, is a large, deep dish or pot used both in the oven and as a serving vessel. The word casserole is also used for the food cooked and served in such a vessel. Casseroles usually consist of pieces of meat or fish, various chopped vegetables, a starchy binder, such as flour, potato or pasta, and, sometimes, a crunchy or cheesy topping. Liquids, such as stock, wine, beer, cider, or vegetable juice, may be added when the dish is assembled for baking. Casseroles are usually cooked slowly in the oven, often uncovered. They may be offered as a main course or a side dish, and may be served in the dish in which they were cooked. Types of casserole entrees include ragouts, hotpots, cassoulets, tajines, moussakas, lasagnas, shepherd’s pie, gratins, rice or macaroni timballi, and carbonnades. A distinction can be made between casseroles and stews: stewing is a cooking process whereby heat is applied to the bottom of the cooking vessel (typically over a fire or on a stove), whereas casserole cooking is generally done in an oven where heat circulates all around the cooking vessel. Casseroles may be cooked covered or uncovered, while braised dishes are typically covered to prevent evaporation. In 1866, Elmire Jolicoeur, a French Canadian immigrant, invented the precursor of the modern casserole in Berlin, New Hampshire. The casseroles, we know today, are a relatively modern invention. Early casserole recipes consisted of rice that was pounded and added to a savory mixture of meats such as chicken or sweetbreads. Some time around the 1870s, casseroles underwent a change and cooking in earthenware containers and the idea of a one-dish meal became popular in America. By in the 1950s, new forms of lightweight metal and glassware appeared on the market and, by the 1970s, casseroles took on a less-than sophisticated image. Southern Italy is the land of combinations, so casseroles fit in perfectly. While they certainly enjoy a piece of simple grilled fish with lemon juice drizzled on it, you will find other dishes, such as lasagna, eggplant parmesan, or baked codfish with bay leaves and fennel. The mixing of certain vegetables such as eggplant, tomatoes and potatoes to make a colorful Ciambotta, a mixed vegetable stew, cooked in four separate steps, is unique. The cooking of the southern Italians is, also, evolutionary. Take for example the Teglia (or tiella) Barese, a Pugliese casserole classic from Bari (mussels baked in a casserole with rice). This dish was not thought out or designed. It just happened through time. The Arab people introduced rice into southern Italy, somewhere around the year 800. Additionally they occupied Spain and introduced it there (perhaps giving us a first look at paella), and probably inspiring the combination of rice and mussels. After cooking this dish many times, the cook added just a bit of vegetables because they were at hand or because the yield had to accommodate one more mouth. The cheese, always at arm’s length, soon found its way into the dish. The addition of potatoes and tomatoes dates this version of the Tiella, to after the mid-1500’s or so, because potatoes were not known in Italy before then. They came from the new world along with tomatoes, chocolate, corn and turkey. After the Tiella made its way this far, it became a classic dish. Similar Casseroles were conceived, ingredient by ingredient, probably by necessity or availability, and eventually they became standards. 1 large eggplant, about 1 lb. Trim off the stem and leaves from the eggplant, peel if you prefer and cut it crosswise into 1/4 inch thick slices. If young and very fresh there is no need to salt the slices (otherwise see below). Peel the potatoes and cut them crosswise into 1/8 inch thick slices. Core the peppers and discard the seeds, cut them in 1/4 inch slices lengthwise. Peel and core the tomatoes, and chop them. Put just enough oil in a large frying pan to barely cover the bottom of the pan. When the oil is hot, saute the eggplant slices until they are nicely browned on both sides turning once. Add more oil as needed. Remove them to a large casserole that will eventually hold everything. Alternately, you can grill the eggplant slices instead of sauteeing. Brush slices with olive oil and grill on a stove top grill until browned and soft. Brown the potato slices and put them into the casserole with the eggplant. Cook the peppers until they are lightly brown, and add to the casserole. Meanwhile, heat the oven to 375 degrees F. Scatter on the chopped tomatoes, the garlic, salt and pepper and mix well but carefully. Bake for about 30 minutes or until bubbling. Serve hot on its own, or use as a contorno, side dish, for roasted or grilled meat, fowl or big fish. NOTE: To remove excess water from eggplant or remove bitterness in older ones, sprinkle both sides of the slices liberally with salt. Place in a non-reactive colander overlapping each other. Place a bowl or a dish inside the colander on top of the eggplant slices, and place a 1 or 2 pound weight on it. Let stand for about 1 hour. Rinse slices quickly under cold running water and pat dry. This is an easier version of the Italian-American classic. The traditional dish uses small slices of beef round, but in this recipe, a whole flank steak is used because it’s easier to stuff and roll one large cut and flank steak has great flavor. Set the flank steak on a large cutting board. Using a sharp knife, slice the steak lengthwise down the middle (about 1/4 inch) and cut toward the edge without cutting all the way through the meat. Repeat with the other side and open it up like a book. Using a meat mallet, flatten the meat so it is about 1/4 inch thick. Sprinkle both sides of the meat with 1/2 teaspoon salt and 1/2 teaspoon pepper. For the stuffing, put the mozzarella, Parmigiano-Reggiano cheese, bread crumbs, and basil in a food processor and pulse to combine. Sprinkle the stuffing evenly over the beef, leaving a one inch border all around, and roll it up lengthwise, jelly roll–style, enclosing the stuffing. Secure with kitchen twine in five or six places. Heat oil in a large Dutch oven over medium-high heat until it’s shimmering. Add the beef and cook until it browns and releases easily from the pan, about 2 minutes. Flip and cook the other side until browned, about 5 more minutes. Transfer to a large plate. Add the onion to the pan and lower the heat to medium. Sprinkle onion with 1/2 teaspoon salt and cook, stirring, until the onion wilts completely and turns a light brown, about 8 minutes. Add the red wine and cook, stirring, until almost completely reduced, about 2 minutes. Add the tomatoes and red pepper flakes and bring to a boil. Reduce to a gentle simmer and tuck the meat and mushrooms into the broth. Cover and cook, turning the meat occasionally, until the meat becomes tender and cuts easily with a paring knife, about 1-1/2 hours. Set the meat on a cutting board and let rest for 10 to 15 minutes. Thinly slice and serve topped with the reheated sauce and vegetables. Serve with Sautéed Broccoli Raab and a Potato Gratin or pasta. Season the chicken with 1/4 teaspoon salt and 1/4 teaspoon black pepper. Spread the flour on a plate, and lightly dredge the chicken in the flour. Heat the oil in a large Dutch oven or flameproof casserole over medium-high heat until the oil is shimmering hot. Cook the chicken in two or three batches (to avoid crowding the pot) until well browned on both sides, 2 to 3 minutes per side. Transfer each batch to a plate as it finishes. Return the chicken to the pot, add the green beans, garlic, 1/4 teaspoon salt, and 1/4 teaspoon black pepper, and cook, stirring, for 2 minutes. Add the red wine and cook until it almost completely evaporates, 1 to 2 minutes. Add the tomatoes and their juices, rosemary, and red pepper flakes. Bring to a boil, then lower the heat to a steady simmer. Cover, leaving the lid slightly ajar, and cook, stirring occasionally for 15 minutes. Add the olives, and continue simmering with the lid ajar until the chicken and green beans are very tender, about 5 minutes more. Adjust salt and pepper to taste. Serve with Garlic bread. Black sea bass makes a good substitute for snapper in this recipe, if red snapper is not available in your area. Position a rack in the center of the oven and heat the oven to 325°F. Season the snapper all over with salt and pepper. Let sit at room temperature while you prepare the sauce. Heat the olive oil in a 12-inch ovenproof skillet over medium-low heat. Add the garlic and cook, stirring, until softened but not golden, about 1 minute. Add the tomatoes and their juice, anchovies, olives, 2 tablespoons of the basil, capers, and pepper flakes to the pan. Bring the sauce to a brisk simmer and cook, stirring occasionally, until the tomatoes are tender and the juices have reduced to a saucy consistency, about 8 minutes. Nestle the snapper fillets into the sauce, spooning some on top to keep the fish moist. Tightly cover the pan with a lid or aluminum foil and braise in the oven until the fish is almost cooked through, 10 to 15 minutes, depending on thickness. With a slotted spatula, transfer the snapper to 4 shallow serving bowls. If the sauce seems too thin, simmer over medium-high heat until thickened to your liking. Stir the remaining basil, the oregano and vinegar into the sauce and spoon it over the fish. Serve with polenta or couscous. Preheat the oven to 350°F. Lightly spray a 9 x 13 x 2–inch baking dish with cooking spray. Heat the olive oil in a heavy pot over medium-low heat. Add the sausages and cook, until browned, 10 to 12 minutes. Using a slotted spoon, transfer to a large bowl lined with paper towels. Remove paper after a few minutes. Meanwhile, cook the pasta in a large pot of boiling salted water until just tender, about 12 minutes. Drain well and add to the sausage bowl along with the marinara sauce, tomatoes, basil, oregano, pepper flakes, diced mozzarella, salt, and pepper. Toss well. Transfer to the prepared baking dish and cover the top with the mozzarella slices. 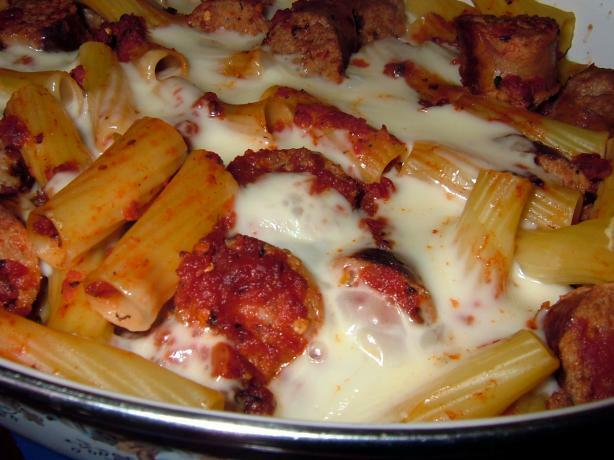 Bake until the cheese is melted and the pasta is heated through, about 20 minutes. Fall is about leaves changing and weather cooling. As fall comes around, you want to bring in all there is to love about the autumn season, including your food. Whether you are serving up a salad course before dinner or looking for a recipe for a potluck dinner, an autumn-inspired salad can be a nice touch. Spring and summer means fresh crisp salads. Just because fall is here doesn’t mean you have to settle for limp lettuce, tired tomatoes or crunchless cucumbers. Make your salads with fall vegetables and fruits to reflect the bounty of autumn. Or look to your pantry for canned and dried staples that you can add to salads along with herbs, vinegars and oils. Pumpkin, carrots, squash, beets, and Brussels sprouts are just a few vegetables that appear on the produce stands in autumn. With the exception of carrots, most have to be cooked. Roast the vegetables to bring out their sweetness. ( For how to oven roast vegetables, see post: https://jovinacooksitalian.com/2012/05/07/vegetables-on-the-side-no-butter-please/). Dress with an apple cider vinegar dressing and serve at room temperature. Sliced raw carrots, cooked beets and blanched parsnips make a colorful autumn vegetable salad. Blanch cauliflower in boiling water for a few minutes, then plunge into ice water. Break off florettes and toss with walnut oil, chopped walnuts and white wine vinegar. Fall fruits are ideal for savory salads. Waldorf is a prime example, a combination of apples, raisins, celery and walnuts in a mayonnaise dressing. Consider a fruit slaw of bright red crisp apples, complemented by a citrus juice dressing with added cayenne pepper for a touch of spice instead of mayonnaise. Pears are mellow and at their peak in the fall. Combine sliced pears with bleu cheese, sliced almonds and baby spinach leaves. Try a red grapefruit, avocado, jicama and butter lettuce salad. The avocado melts into the grapefruit juice, so no dressing is required. Pears are a traditional fruit of the autumn season. Since pears are plentiful during the fall, you can purchase them at reasonable cost. Create a sautéed pear salad with warm nuts and a cider-vinegar dressing. Use fresh pears paired with celery, white cheddar and a warm dressing for a crunchy pear salad. Pair green lettuce with warmed walnuts, fresh pears and a maple vinaigrette dressing for a more traditional salad. * Be sure you’re buying 100% pomegranate juice, as some juices advertised as pomegranate juice are a blend of apple or grape juices with a small percentage of the more expensive pomegranate juice. POM is an excellent brand, but there are also other brands that are pure pomegranate juice. In a small stainless steel or non-reactive saucepan over high heat, boil the pomegranate juice until reduced to 1/3 cup, approximately 9 or 10 minutes. Remove from heat. While still warm, stir in the sugar, salt, balsamic vinegar, and olive oil; set aside to cool. With autumn comes the use of spiced nuts and legumes. Common nuts and legumes in the fall season are pecans, walnuts, pine nuts and lentils. Create a warm lentil salad with fresh spinach, pecans and sharp cheddar cheese. Use toasted nuts to top off a salad for a crunch. Toasted walnuts and pecans are suitable in both savory and sweet salads, and they work best when paired with fresh fruit or a fruity vinaigrette. A salad is not a salad without a dressing or vinaigrette (an emulsion of oil and vinegar with herbs and spices). Fall vinaigrettes and dressings should be warm and rich in flavor. Use maple syrup to create a maple-balsamic dressing that has a bite of mustard and a sweet accent. When in a hurry, create a quick vinaigrette using apple cider vinegar, mustard powder, extra-virgin olive oil and salt. Adjust portions according to taste and tartness. Cook broccoli in boiling salted water for 1 minute. Drain well. Combine the broccoli with onion, tomatoes, nuts and cheese. In a small bowl, whisk together oil, vinegar, sugar, pepper and salt; pour over salad mixture and toss to coat. Slice the celery stalks quite thinly – 1/8-inch. In a small bowl, make a paste with the olive oil, lemon juice, and Parmesan. Set aside. In a large bowl toss the heated beans with the olive-Parmesan mixture. When well combined, add the celery, raisins, and most of the almonds. Toss once more. Taste and add a bit of salt if needed. Serve in a bowl or platter topped with celery leaves and remaining almonds. In a medium bowl, gently stir together, turkey, apple, celery and shallot. Pour dressing over chicken mixture. Serve on lettuce leaves, sprinkle nuts of your choice over. Whisk together the vinegars, lemon juice, mustard, brown sugar, salt, and pepper. Whisk in the oils. Taste and adjust seasonings. Salad: In large bowl, combine chickpeas, parsley, tomatoes, cucumber, onions and cheese. Dressing: Whisk together oil, vinegar, garlic and seasonings. Toss dressing with salad ingredients. Cover and refrigerate for several hours. Place pears in medium bowl; toss with salad dressing. Add arugula; toss again. Arrange arugula salad on 4 plates. Divide chicken slices and place on top of salad. Sprinkle with walnuts.